On Saturday, November 21, 2015, we proudly celebrated the 238th birthday of the City of San José at the Peralta Adobe-Fallon House Historic Site. We offered festive crafts for kids, hands-on activities, and an opportunity to learn about the people who lived in these historic homes. In the Fallon House, we offered a special family-friendly tour, leading visitors through a day in the life of Annie, Thomas and Carmel Fallon’s beloved daughter. Visitors were introduced to children’s birthday celebrations during the 1800s when Thomas and Carmel Fallon lived in the home, complete with a real cake to celebrate Annie’s birthday. Preheat oven to 350. Line two 8-inch cake pans with paper. Cream butter and sugar; add flour and milk alternately until well blended. Stir in baking powder. Add whatever flavoring desired* (2 teaspoons lemon extract, 2 teaspoons raspberry extract, or 2 squares of melted unsweetened chocolate). Stir in egg whites. Divide into cake pans. Bake at 350 degrees for 30-40 minutes. Cake will begin to pull away from sides of pan when done. Cook and frost as desired. 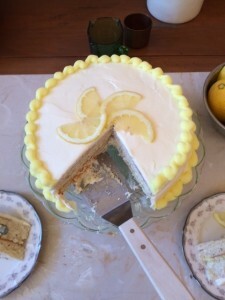 *For Annie’s birthday cake, we used 2 teaspoons vanilla extract to flavor the batter, and we used vanilla and lemon frosting. Special thanks to History San José Program Interpreter Tori Bohnett for her baking skills!